The focus of scrutiny of any electric bike skeptic is always the straight line performance – how fast is it, how far does it go on a charge and how long do I need to charge it for before I can ride it again. Well, to answer those questions; it’ll do 110mph flat out, up to 128 miles and it takes 3.5 hours to charge from empty. But what isn’t often spoken about is the benefits to handling an electric motor offers. Even with the tiny gearbox, the number of rotating powertrain components on the Brammo pales into insignificance compared to how much stuff spins about in an internal combustion engine. So what? So, that means far fewer gyroscopic forces to battle when you want to get into a turn. Yeah, I know, we’ve heard that before about a million different technological advances and I’m buggered if I can feel the difference most of the time. But trust me, this really does feel better. The Empulse R drops into a corner like a Moto3 bike, smooshing slider across tarmac with no effort whatsoever. 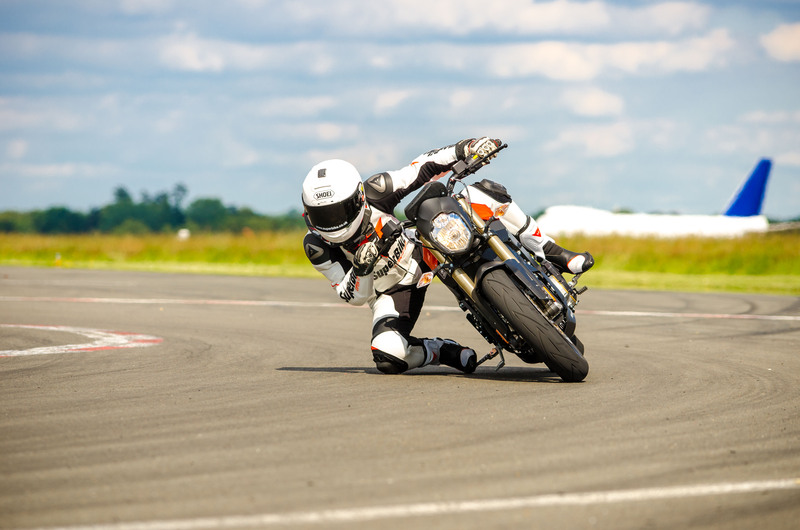 It’s so addictively easy, I found myself weaving up the runway of the Top Gear test track we were riding on, carving long, sweeping turns on each knee. Knee down photos? No problem, I’ll just ride round here in a constant circle with my knee on the floor, you fill your SD card me ol’ son. The Brammo Empulse is honestly the easiest bike in the world to get your knee down on, that’s a big fat win straight away. That’s the Top Gear test track there don’cha’know. When you shut the throttle on the Brammo, the motor goes in to re-generation mode, sticking some charge back into the batteries. That’s good for two reasons – firstly it gives you more battery range and claws back some energy that would be normally wasted into the brakes. Secondly it means you get what feels like engine braking – another notch in the ‘feeling like a normal bike’ bedpost. Not that you’ll notice that for long, you’ll be too busy thinking up new expletives to describe how powerful the brakes are. I’ve used Brembos like this before, plenty of times, but these ones feel unbelievably powerful. It’s not a light bike to stop, particularly, but the braking system feels like it’ll ripple the tarmac if you get too keen on the lever. So obviously it’s ripe for stoppies and, with a good tug on the handlebars, it’ll wheelie happily too. Which brings me nicely to the subject of the clutch, namely its apparent redundancy on an electric bike. You do not need to use the clutch on the Empulse. You can just wind the throttle open and cruise off, shifting gears as you please. But for slow speed stuff, the on/off throttle response does reveal a little slack in the transmission, which you can smooth out by using the clutch. In reality, using the throttle and back brake against each other does everything you might want the clutch to do, but it’s just nice to have that lever there if you want it. Once again, it’s a feature that works to convince you that you’re on a normal sports bike. Riding the Brammo feels like riding a normal motorcycle. That’s its first hurdle conquered, because we don’t want some new-age fancy pants battery burner, we want a motorbike. We love riding bikes as they are, so why try and make something that feels completely different? The Empulse R wheelies, stoppies, skids and destroys knee sliders as good as any dinosaur-burning bike. It made everyone who rode it laugh, smile and overrun their time slot. It does plenty of things as well as a normal bike, it steers better than all but the finest supersport bikes and it costs next to nothing to run. At the price, which is still steep, I’d have hoped to see ABS, but I guess we’ve got to be realistic. The technology is still in its infancy and not cheap. 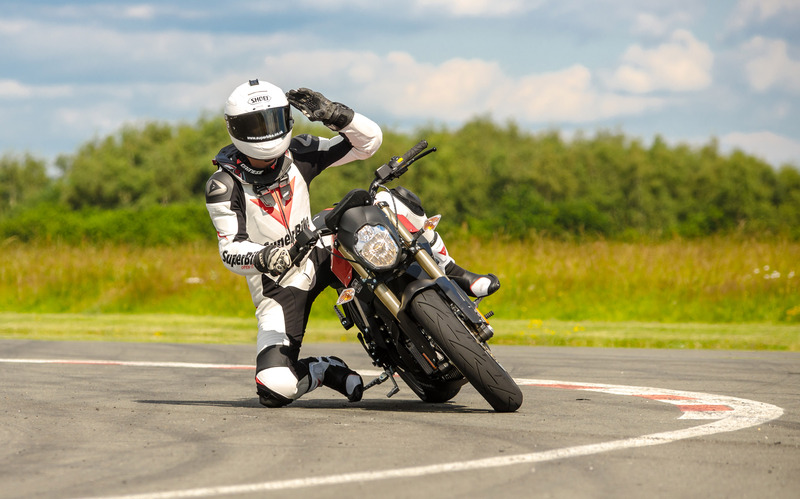 Brammo, we salute you. An electric sports bike that makes us smile – win. If you can live without the noise, the Brammo has a lot to offer and being quiet means you get a lot more fun in under the radar. Yes, riding a bike is an emotional experience and part of that emotion is the sound and smell. But two strokes sounded and smelt amazing, and when they were phased out we carried on having just as much fun. Yes we miss them, but I sure don’t miss the constant fettling, oil consumption and frequent mechanical temper-tantrums. With the ‘leccy bike, there are no valves to check, no piston rings to wear out and no injectors to get blocked. Yes they have their own maintenance requirements, but there’s a lot less to look after than on a petrol engine. Less time and money spent riding and maintaining the daily ride means there’s a perfect opportunity for that Suzuki RGV250 two-stroke project in the garage you’ve been dreaming about. Now that’s man-Maths at its finest. If this is the future, then bloody well sign me up. Full specs can be found here. The Brammo Empulse R is being distributed in the UK by Goingreen. Give them a shout on the details below to get your hands on the fastest production electric motorcycle you can buy.